The geology of England, particularly in the south with its rolling chalk hills (downs) makes it very suited to the creation of these figures – which are often just called ‘Chalk Figures’. The county of Wiltshire is especially well known for these figures. There are three main methods of creating them, the first being one used in areas where the soil is thin. It involves stripping away the the turf and soil so that the underlying white chalk stands out clearly. This is a quick method, but one that needs regular maintenance if it is not to become overgrown and disappear from view. A second method is known as the trenching method, used in areas where the chalk is not near the surface. It involves digging trenches down to the rock along the figure’s outline and filling them in with rock brought from elsewhere. This is a far more permanent method and allows traces of the figure/design to remain visible even when it becomes overgrown. The Uffington White Horse was created by this method. A third method, known as the covering method, involves laying rocks along outlines cut into the turf, and is generally used in areas where there is either no underlying chalk, or no tools are available for cutting down to it. The Fovant Regimental Badges, on a chalk hill in south-west Wiltshire, are examples of the covering method. They were created by soldiers garrisoned nearby waiting to go out to France during WW1. The first was made in 1916, although many of the original carvings failed to survive the elements and by the end of WW1 there were 20 identifiable badges. During World War II, they were left to become overgrown so they couldn’t be used as landmarks by enemy aircraft, but once war ended the local Home Guard formed themselves into an Old Comrades Association and began the task of restoration. I believe only twelve remain today. I’ll say a word here about the painted horse at Cleadon, up in North-East England. This is quite different to the hill figures of further south, being a small figure of a white horse, two metres tall and three metres long, painted on a low cliff on the hill. Interestingly, it is one of only four ‘horses’ in the UK that face to the right. Today it is very defaced by graffiti. It’s thought to have appeared in the 1840s and there are at least six possible reasons for its creation. I won’t go into these, but I’ll add a link HERE to a site with a photo of it in its graffitied state and a little bit about it so you can have a quick look at it if you’ve time. The reasons for the creation of hill figures are still obscure, but the practice dates back to prehistoric times. They could have simply been created for artistic reasons, or as representations of particular gods. They may even been symbols of the nearby tribe and act as a warning to other tribes to keep out of their territory – as the Uffington White Horse. Stylised in shape, this is the oldest hill figure in Britain, now believed to be 3000 years old. It is also the second largest figure measuring 360 feet /110m by 126 feet/38.5m. It is located in Oxfordshre (formerly Berkshire) about a mile and a half from the village of Uffington, the village associated with the famous 19th century novel, Tom Brown’s School Days, written by Thomas Hughes. The figure is believed to have held political significance as it sits high on the Berkshire Downs escarpment, dominating the valley below – aptly called the Vale of White Horse. It is thought there were many white horses at the time of the Celts, but time and the ever invasive grass and weeds have caused many to disappear from view. As I mentioned above, there are sixteen known white horses in the UK today. White horses were considered to be lucky by the Celts, as were horseshoes. Some historians believe the Uffington Horse figure represents the goddess Epona, protector of horses, who was connected with the local Celtic tribe, the Atrebates. An alternative theory suggests it is not a horse at all but the mythical dragon slain by Saint George. 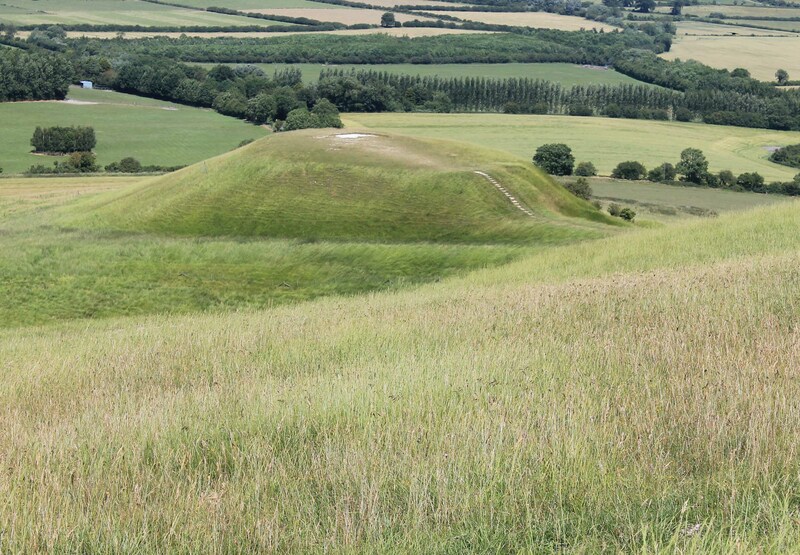 A mound at the foot of White Horse Hill is known as Dragon Hill. 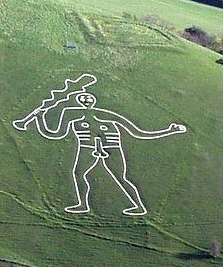 The Cerne Abbas Giant is 180 feet/55 m high and 167 feet/51 m wide, making him the largest human chalk figure in Britain. The club in his right hand is 120 feet in length. The figure was created by a turf-cut outline being filled with chalk. It was once thought to have been Celtic in origin, some sources claiming he was identified as Hercules during Roman times. But the figure’s actual history can’t be traced back further than the late 17th century, making that claim difficult to prove. It is not mentioned in writings before 1694, and it has been suggested the figure is an offensive representation of Oliver Cromwell. It isn’t known how many hill figures have disappeared over the years, and many at present are in danger of becoming ‘lost’. Grass gradually encroaches and the figures need constant maintenance to keep them visible. Many figure undergo organised restoration every few years. I believe it’s every seven years for the Uffington White Horse. That’s really cool, I had no idea. I’ve never heard of this before they are beautiful. Very interesting! I’ve never read about these before, but now I’d really like to see them in person someday. The Huffington horse is my favorite too. Even if I didn’t know it was the oldest ( which you know is a draw for me) I find the stylized design most appealing. How odd to imagine what the original creators would have thought about which ones survived and which gave been lost over time. The Uffington Horse is my favourite because it’s in King Alfred’s Wessex (my hero!) and it gets a mention in my second book. But it’s also because we once lived on its doorstep for six years. I agree with your attraction to stylised designs. It is a great pity that so many have been lost. A few have been discovered, barely visible, and been restored. Others have a strange history of ‘being worked over’ – meaning that new shapes have been created over the existing ones. It’s funny what our ancestors did! The Uffington Horse has survived so well because of the method of its creation (trenching method). Thank goodness for that. Thanks again, Joy. I’d never even thought about the various methods for trenching, that was really interesting to learn, too. I’m so glad the Uffington Horse was the durable kind, although who knows how many other even more beautiful ones have been lost! Another form of Pentimento. How interesting. Yes, that’s what it appears. I think the style of horse created changed to suit the ‘fashion’ of the times. The Uffington horse is the only stylised one and doesn’t seem to have changed shape over the centuries. I like the Giant best. Hi Dinata. The Cerne Abbas Giant is excellent and never fails to have people laughing. It’s probably more well known than the Uffington Horse, too, simply because it’s impressively funny. As I said in the post, it was once thought to be Celtic, and the design would suggest that, too, but records can’t be found of it that far back. I’ve no idea whether or not they can scientifically test this one, as they did with the Uffington Horse, to prove it was 3000 years old. In the case of the Horse, I believe they could date-test the rock under the rubble in the trenches. But the Giant is ‘turf cut’ and they may not be able test it the same way. I’ll have to ‘have a read’ about it when I get a spare moment. Thanks for visiting! Wow! Quite interesting actually. we don’t have such a thing here in Jaipur! Ah, but in Jaipur you have other amazing things that we don’t have in England – like fabulous, marble temples. And that’s just for starters! All countries have their own ‘wonders’ and I love finding out about them all. Thank you, Arv. Absolutely fantastic, dear Millie, I have never seen anything like that before! I run the website for cerne abbas (cernevalley-dot-co-dot-uk). We’d love to put a link to your article on our website if that is ok with you? Regarding the scientific dating of the Cerne Giant – that is a very interesting idea (to date the rocks below). The Giant is managed by the National Trust so it may be worth checking with them? Fantastic – please let me know what you find out from the NT! so very interesting and you give a wonderful history though the figures are not so old as the old stones!! You must do a post on crop circles if you haven’t before! These remind me of the Nazca lines in Peru which are very mysterious and possibly as old as 500 BCE.. Magnificent! Uffington White Horse is my favorite too – it looks ancient. The Rude Man does look offensive, and his club looks very unusual. Would be very interesting to learn his story. The hills and the valleys are breathtaking – gorgeous photographs and really delightful post! Every time I visit you, I learn so many interesting things, and not just about Great Britain. I think I would like to visit England again just to go on a quest for these wonderful pieces of natural art. Thanks, Millie and I hope all is well with the writing. Hi, Clare. Sorry for the late reply but we were in Iceland last week and I only had my Kindle with me – which I really can’t type on! The hill figures are interesting, but the only two I really find fascinating are the Uffington White Horse and the Cerne Abbas Giant. Needless to say, my writing isn’t doing too well at the moment but I’ll have to make a concerted effort with it now I’m home. Goodness knows when my book will get finished at this rate. I hope yours is doing much better! Thanks for visiting, Clare. I’ll hop over to your site very soon. Millie, I’m planning to have a launch in the spring of 2017. But my little mystery book is nowhere near the complexity of your historically- based trilogy. I have no good excuse for the procrastination except that I am enjoying the Fall and am not spending much time in front of my computer. Wow!! I had not heard of hill figures before… This is all new to me. Wonderful, Millie!! Thanks, Christy. I’m in Iceland this week and haven’t been on my blog until today (Thursday). I’ve just popped over to your site and read your interview. Well done! You’ve given some excellent advice to writers. People of olden times knew how to create art, especially with so less tools available to them. That’s a fascinating and excellent piece. I love the Uffingon White Horse and, of course, the Cerne Abbas Giant always raises a smile, so to speak. I didn’t realise we had so many…and I’ve often wondered whether they had anything in common with the Nazca Lines in Peru.